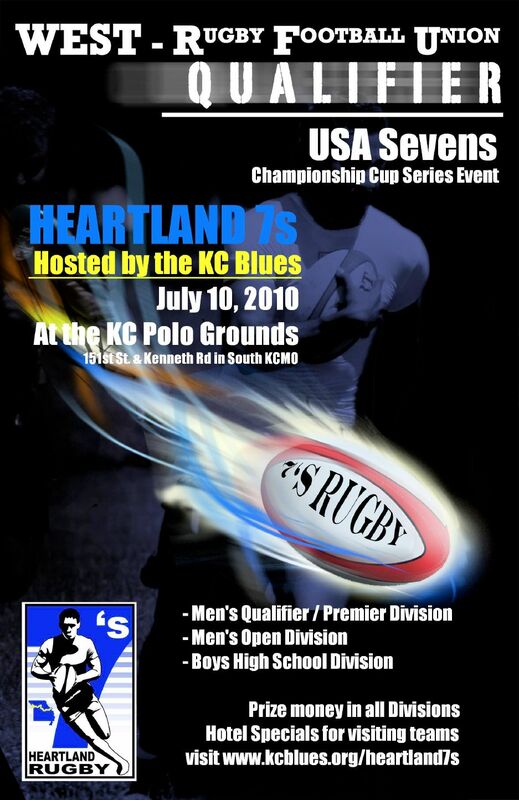 Hoping you guys can join us in Kansas City on July 10 for the Heartland 7s. If someone else is running your Summer 7s program, can you please push this on to them? The Heartland 7s will again serve as a West RFU Qualifier for Nationals, as well as a qualifying event for the USA Sevens Championship Cup Series… we’d love to have both West RFU and non-West teams join us for all Divisions as there is something in this for everyone. It’s a long ways to travel for some teams, but KC is a great place to visit in the summertime and this tournament will feature some excellent rugby, at a new venue for us in south KCMO. Well worth the trip. Aspen, Chicago Lions, Dallas Harlequins, Denver Barbarians, St. Louis Ramblers, and San Antonio have already committed to join the KC Blues in the 12-team Premier bracket… there’s still room for more though. In addition to the Qualifier/Premier bracket, we’ll have a Men’s Open Division with prize money to finalists, along with a Boy’s High School Division. The Open bracket still has plenty of space so pass the word amongst your Club and let us know if you’re interested. Our goal is a 12-team Open Division and an 8-team High School Division, so we’ll be able to guarantee 3+ matches for everyone… it will be a GREAT time and has always been a very competitive and fun Open Division. We’ll also have hotel specials and an awesome tournament party afterwards for all players and supporters.